A properly maintained tile roof should last decades. Here is how to perform simple tile roof repair. It is important to never, ever walk on a tile roof. You’ll end up having to replace your entire roof if you make this mistake, rather than a simple roofing repair. Although basic tile roof repair can be done by a homeowner, roofing repair is generally best left to a roofing professional who has the experience and the proper safety equipment to get the job done safely. 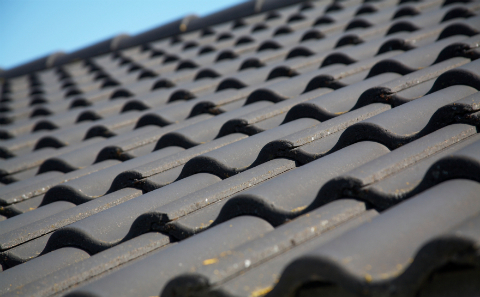 Firstly, ensure you have the right tiles to perform your tile roof repair. Roof tiles come in many shapes and material. You will end up cracking all the tiles around your replacement tile if you force the wrong tile in. If you do not know what kind of tile you have, bring in a sample to your local hardware store. Get on the roof using a proper ladder and a safety harness. Do not use a ladder as a work platform for your tile roof repair, unless you want to end up with a broken back. Set up scaffolding instead. Tile roof repair is fairly basic – you want to gently lift up the surrounding tiles so you can remove the broken one. You can do this with pry bars or thin pieces of wood. Slide your bar under the top right tile to the broken tile, and gently nudge it into place. Do the same for the tile located to the left of the tile you wish to replace. Now that no other tiles are resting upon the broken one, you can remove it. Slide your new tile into place, and remove the pry bars. Check that all tiles are sitting properly. If not, repeat the process again. If you are performing tile roof repair on a fairly weathered roof, you may not like the difference in color between new and old. If this is the case, remove an intact roof tile from a less visible area and install this in place of the broken tile. If you notice that your roof is in need of a large amount of roof tile repair, it might be a sign that you need a full roof replacement, or that there is something structurally wrong with your roof. If this is the case, contact a professional roofing repair specialist to make an assessment.